Train Ferries are particularly appropriate subjects for small layouts. Their yards have unique switching (shunting) patterns, and the ferry behaves very much like a real-world fiddle yard, supplying a continuous stream of cars to the layout for further handling. There are a variety of approaches to using these waterborne trains on our layouts, and this Scrapbook issue provides a flotilla of examples. We’ve also carefully included enough prototype information to show that we’re not just making this up! There are plenty of ideas here for your next layout, so bon voyage! Ferries like the Bali Sea (shown above and below) can carry up to 115 railcars per sailing on the double decks. It takes over seven hours of intensive shunting to load the ship! You can watch the process in CG’s online video. 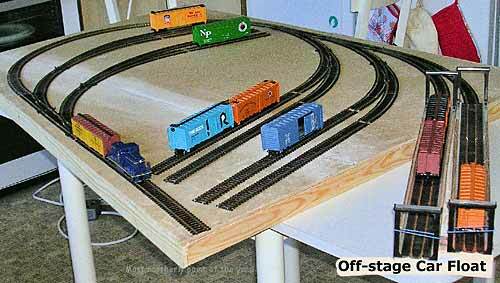 The three track apron would allow filling three fiddle tracks with cars. This “three track cassette” could be removed and replaced with another, indicating that a sailing had occurred and a new set was ready for unloading. This arrangement creates a kind of ultimate car-spotting destination that can accept a lot of rolling stock of many types. Mike pointed out, however, that there are lots of other possibilities. To demonstrate, he rolled the clock back to the original layout on a single level of the Bali Sea’s deck. “Here’s a photo and drawing (below, left and right) of the original configuration with only a single deck having eight tracks and two crossovers on either side. With a switching loco and the Factory Direct Trackmobile you’re in business. [Mike works in HO scale.] Note that the apron has only two tracks: the ship was warped from side to side to access the four center tracks,” Mike explained. In other words, the vessel itself was used as a transfer table (traverser) to align with the correct tracks on the apron! The two extra tracks on either side of the deck not connected to the shore are provided with crossovers. The basic operation is simple: “Cuts of cars are pushed into the first crossover, and then the Trackmobile zigs them into place on the outer two tracks. “The fiddle yard (second from top right) would be behind a screen British-style and would be a traverser-type installation to feed the two apron tracks. A little stub could hold two identical switch engines for pushing cars aboard the ferry, or it could be a mini-traverser off the big traverser, or you could have a single stub with a wye switch. Lots of options. “Admittedly this takes a lot of space, so I’ve shown two smaller options to cut down the length of the terminal. One is for a six-track ferry and the other is four-track. Shorter for sure, but both still have a pair of switch-back crossovers for switching with that Trackmobile. The fiddle yards would be similar to the full-size version, just with fewer and shorter tracks, the smaller layout having a single apron track. Wow! A whole switching layout on a model ship’s deck! And completely authentic (but perhaps compressed)! Ingleferry Wharf was designed to break down and fit into a shoebox for transport, so the car barge is about one-tenth or less the size of the Bali Sea above. Its construction is much simpler as well (below). Basically it’s a shaped plank with lines of bollards along either side and tracks down the middle. 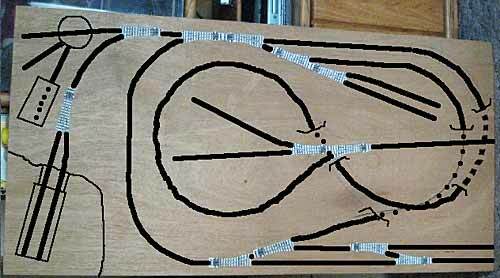 All Jack’s tracks measure three car-lengths, so he has permanently mounted a car on each of the outer two tracks, to enforce the 3-2-2 pattern. You’ll find a discussion of 3-2-2 Inglenooks in Carl’s article on “How Small Can a Satisfying Inglenook Be?” in Scrapbook #69. Jack lives in the Highlands of Scotland and is a frequent and welcome contributor to this site. 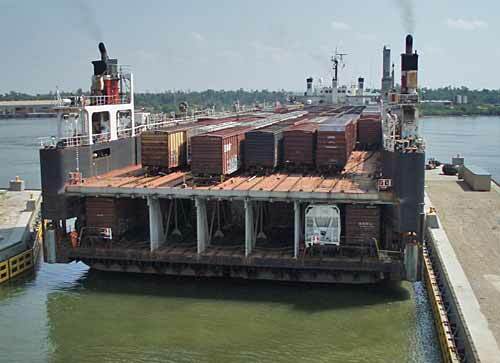 Another ingenious approach to constructing a car barge was contributed by Jack Matson, from Vancouver, Washington USA. 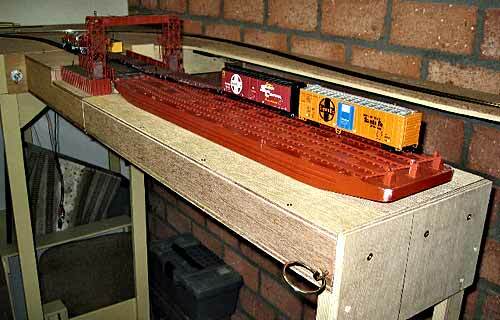 Jack built this two-track barge for his HOn30/OO9 version of Crooked Creek Railway (below). 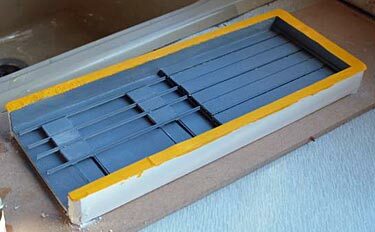 The barge measures 12x4in (30x10cm), and the deck is removable and replaceable. So the barge acts as a functional chunk of scenery, in full sight, but the deck can be removed and replaced with another holding a different consist, just as a cassette would be used in a hidden fiddle yard. Jack made four decks for this particular float, planning to work it pretty hard! 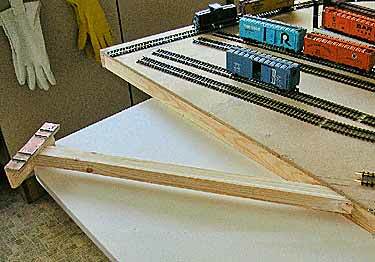 Two tracklaying tips from Jack: first, don’t try to hand lay track directly on plywood (this mistake thwarted progress for a long time); and second, you can make your own accurate turnout templates by placing actual turnouts face down on a copying machine and copying them. 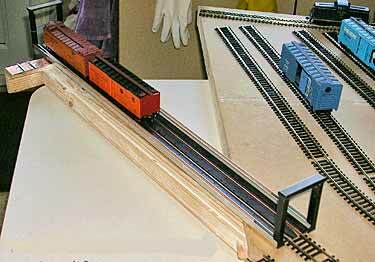 Jack’s templates (of Peco OO9/HOn30 switches) are visible in his layout photo. 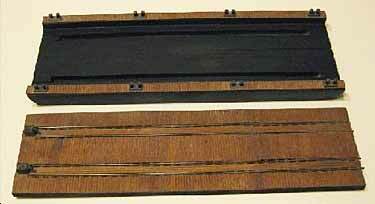 Here’s another approach to placing an entire switching layout on shipboard—or in this case, on barge-board. Andy Anderson, from Southampton, England, returned from a Scandinavian holiday enthusiastic about the shunting possibilities he’d found on a little local ferry that served passengers and freight in rural areas. The original ferry used forklifts to handle the cargoes, but Andy envisioned a tiny electric switching locomotive and small four-wheeled freight wagons. The result of his thought process is shown here… it’s a self-contained shunting system on a barge, with a two-track transfer table (traverser) and three storage tracks holding three cars each (or two cars and the loco, as shown above). 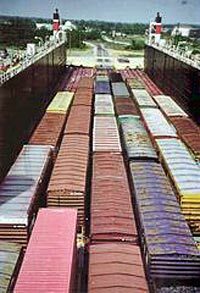 The basic idea is that the little barge, called Amos Gnollies, plies its trade along the coast, dropping off freight wagons at various ports of call and picking up others along with some empties. During the voyage between ports, the crew busily sort the wagons in the little shipboard yard, according to various complex game-theory-generated sets of rules that Andy is concocting. Scale is Gn15 and size is 9¼x5in (23x13cm). For much more detail and construction information, see this thread on the Gnatterbox. Looking back through past issues of this Scrapbook, there are two layouts using train ferries (or railcar floats) that stick in the memory. The first, from Scrapbook #47, is Jack Trollope’s Ross County Shortline (above). This 57x8in (145x20cm) line represents a small industrial yard that receives its freight via a car float. The water (river/lake/sea) is removable, but the car float stays in position fixed by two brass tubes into the dockside. Operation consists of bringing the cars in (four at a time on the float) and distributing them to the various sidings served by the line. The other memorable layout (below left) is from Scrapbook #19. It’s actually a FREMO module of a car float, built by Bart Bakker, from Utrecht, Netherlands. At the left side is a conventional FREMO interface, where the ferry apron connects with the rest of a FREMO modular exhibition layout. At the right, however, is a 68cm (27in) waterway holding a Walthers HO car float. But because long peninsulas sticking out into aisleways are dangerous to the operators’ health, this one can fold down out of the way when it isn’t in use (below right)! The module is called Atlantis Port Ferry, because it has the magical property of conveying railcars from the US to Netherlands and beyond! In Scrapbook #88, Will Ayerst showed us his design for a close-to-exact scale model of the Harlem Station. And last month we saw Jack Trollope’s HO version of the little yard (right). Jack’s design also provided a new look at car float modeling… he uses Peco Loco Lifts to form removable cassettes in fiddle yards. And in this case, he joined two 24in (60cm) cassettes to simulate a car float in the Harlem River. The key is the T support brace (lower left) that plugs into the main layout and provides a “far-end” support for the Loco Lift cassette. Jack includes an electrical connection in the plug, even though the Loco Lifts draw current from the tracks on which they rest (he calls this his “belt and braces” philosophy). 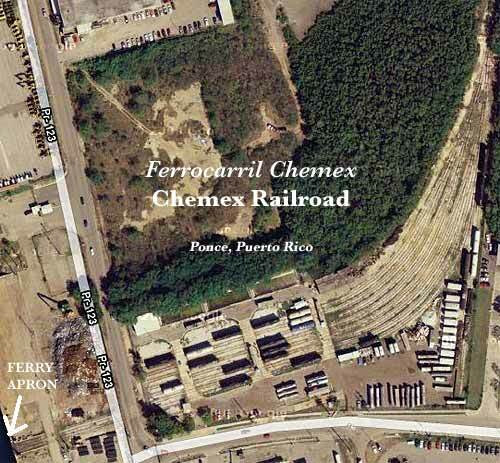 Roger Aponte first showed me the only currently-operating industrial railroad in Puerto Rico: the Chemex Railroad. It’s a real, live micro layout—only half a mile long (0.8km), consisting of an eight-track yard connected to a barge apron (the map shows nearly the entire railroad). 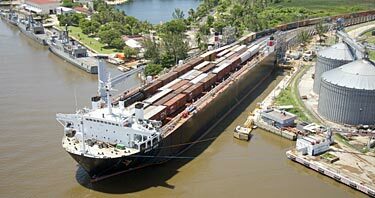 About twice a month, a barge from Mobile, Alabama, brings a load of about 20 tank cars to the Chemex dock in Ponce (pron. “PONE-say”), in the south of PR. The railroad’s two diesels quickly unload the barge and distribute the cars around the yard. Virtually all tracks have paved access, and local businesses unload the cars as needed. 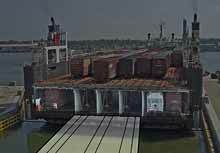 Empty cars are shunted onto the barge to be returned to Mobile. 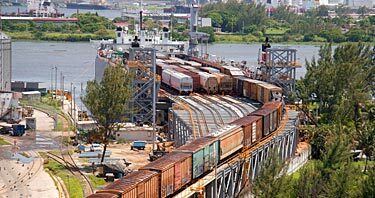 For more info, see Roger’s excellent bilingual web site, Ferrocarriles de Puerto Rico / Railroads of Puerto Rico. Photos courtesy Ferrocarriles de Puerto Rico, used with permission. Mike McLaughlin seems to have an affinity for rail water traffic (see CG Railway above and The Volga Boatmen below). 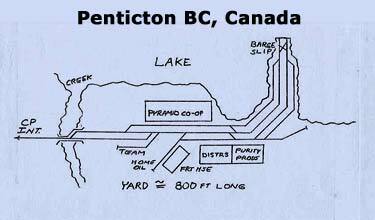 Mike also found a tiny prototype railcar barge terminal on the Canadian National Railroad in Penticton, British Columbia, Canada. The scene is highly modelable—there’s a small barge apron, a group of industries gathered at the terminal, and a useful off-stage interchange with the Canadian Pacific. 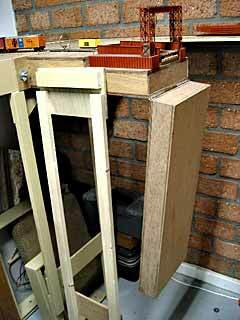 The only motive power available is a Trackmobile, which encouraged Mike to design a micro layout and enter it in this site’s Trackmobile Layout Competition in 2008. You can find more details in Mike’s contest entry. The Volga River is the largest in Europe. At the town of Saratov, in southern Russia, the Volga represented a major block to east-west railroad traffic and had to be crossed by ferry from one bank to the other until a very long bridge was finally built in the 1930s. In the 1890s a British firm, Whitworth & Co., designed and built for the Ryazan-Ural Railroad a unique rail ferry (above right) that solved two major problems: it was an effective icebreaker in winter, and it could cope with varying water levels of up to 45 feet (in the spring melts)! 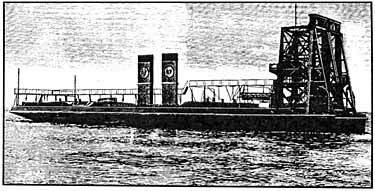 Mike McLaughlin found an 1899 technical paper by H. F. Swan describing the ship. Mr. Swan dimensioned the vessel at 252ft length, 55ft 6in breadth, and 14ft 6in depth, and remarked, “This vessel has four lines of rails, each pair converging into two hydraulic lifts [elevators] placed side by side at the bow of the vessel, and it is found in practice that the full load of 24 cars can be run off, or onto the shore, in half an hour, and this at varying heights according to the depth of the water.” Amazing! Beginning with just this basic information, Mike laid out the most likely deck arrangement, including trackwork (below). He notes that switch points are on the elevator to maximize track capacity. Still proceeding by guesswork and engineering conjecture, Mike suggests, “My guess is that the shore facility would be a massive concrete structure from the river bed (or below) to as high above the high-water mark as necessary, with everything vertical so as to accommodate the ferry at any river stage. The apron at the highest level would be a permanent steel structure reaching out to the ferry elevators.